Former Catalan President Carles Puigdemont was arrested in northern Germany on Sunday, after a Spanish Supreme Court judge re-issued European international warrants for his arrest along with five other leaders of the Catalan secessionist movement currently outside Spain. Scheduled for arraignment before a German judge on Monday, Puigdemont awaits what many Spanish legal experts are saying is almost certain extradition to Spain within 60 days on charges or rebellion and misuse of public funds in relationship to events surrounding Catalonia’s 1st October unconstitutional independence referendum and subsequent declaration of independence from Spain by Catalonia’s regional Parlament. On Friday, Supreme Court judge Pablo Llarena formally indicted a total of 25 pro-independence politicians and activists on charges that included rebellion, misuse of public funds and disobedience of various Spanish court orders in their drive to seek Catalonia’s independence from Spain. At the same time, the judge remanded into preventive custody five leading members of the Catalan parliament, including Jordi Turull of Puigdemont’s Partit Demòcrata Europeu Català (PDeCAT) party, whose candidacy to replace Puigdemont as Catalan president was scuttled late Thursday by the militant-left Candidatura d’Unitat Popular (CUP) party, in a parliamentary session called expressly to rush through Turull’s election before the scheduled appearance before Judge Llarena on Firday morning. Llarena justified the preventive prison because of what he said was the likely reccurrence of the same criminal acts for which they had been indicted, were the defendants to have remained free on bail while awaiting trial. The judge also mentioned the risk of flight from Spain, alluding in his ruling to Catalan parliamentary deputy and general secretary of the Esquerra Republicana de Catalunya (ERC) party Marta Rovira, for whom Llarena also issued a European arrest warrant after it was revealed she had fled to Switzerland overnight to avoid appearing before the court Friday morning. Puigdemont, arrested almost immediately after crossing into Germany by car from Denmark after a visit to a Finnish university to speak about Catalonia’s independence movement, will fight his extradition to Spain from Germany. The former Catalan leader was en route to Brussels, to which he fled in November as a fugitive from Spanish justice, when he was captured Sunday by German police tipped off by Spanish police intelligence agents who had been tracking his whereabouts. Puigdemont seemed to have successfully faced down a previous European arrest warrant in Brussels, because the crime of rebellion for which he is sought in Spain does not have a counterpart in Belgian law. In December, Llarena withdrew that arrest warrant pending formal indictment of Puigdemont and four other former members of his regional government who had fled Spain for Brussels. 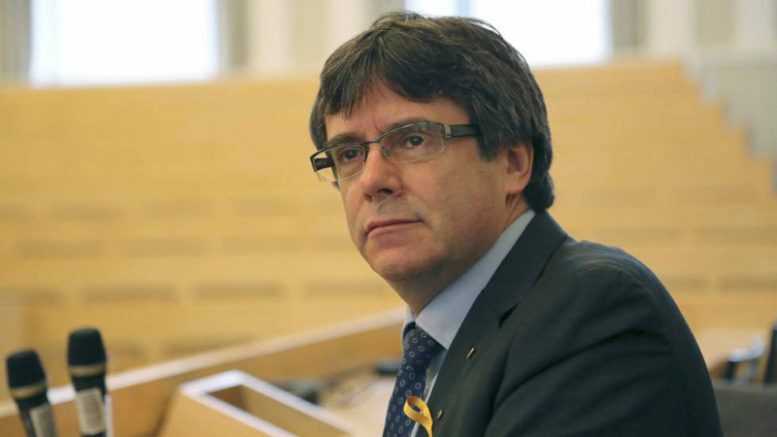 Legal experts cited in Spanish media reports now say that because Puigdemont was arrested and is being held in Germany, where the penal code includes a crime of “High Treason” that is very similar in description and potential jail sentences to the Spanish crime of rebellion, the likelihood the former president will be returned to face trial in Spain is much greater than had he been arrested in almost any other European country.